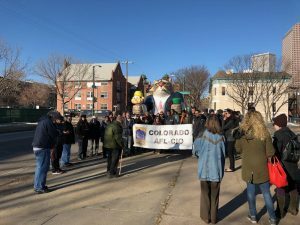 Today, when the AFL-CIO of Colorado showed up to protest at the Independence Institute’s Freedom Embassy, they were greeted with a surprise. Instead of calling the police or staging a counterprotest, the think tank jokesters greeted union thugs with coffee and donuts. What jerks those Republicans are. The protest was to mark the opening oral arguments in front of the Supreme Court in Janus v. AFSCME, a labor union that steals money from the paychecks of hardworking Americans even to spend electing Democrats, even if those workers don’t belong to the union. It’s truly one of the most obscene rackets in the union underbelly. And that’s saying a lot. Beyond the Independence Institute’s hijinks, word on the street is that the anti-union protesters at the U.S. Supreme Court out-numbered the pro-union protesters, which is a huge coup.